Last time it was my turn to blog, we met Kevin McGregor, the hero of my debut novel, Wisdom to Know. Since people enjoyed getting to know him, ever so briefly, I thought it only fitting that we get a chance to sit down with Lydia this month. Me: Thanks for joining us, Lydia. Lydia: Sure. Though you didn’t really give me much of a choice. You’re bossy, you realize that? Me: I guess…probably all part of being an author. But we’re not talking about me. Why don’t you start off telling us a little about yourself. Lydia: Really? You’re going with that as your first question? All right, fine. Let’s see, I’m the third of four children, all girls. My dad’s a pastor at what started out as a small church but has grown into a pretty big congregation here in the D.C. area. It’s fun to rub elbows with high-ranking military folks and government officials on Sunday mornings. I’m in PR, myself, which basically means I get to help people look good every day and make sure the image they’re presenting is the right one. That’s critical, you know? Especially around here. The guy I’m dating, Brad, is a Congressional staffer and I’m pretty sure there are wedding bells in our future. Lydia: Oh, not yet. But I’m expecting it anytime. By Christmas, for sure. Me: I spoke to your friend Kevin the other day–no romantic leanings in that direction for you? Lydia: Kevin? Don’t make me laugh. He’s a sweet guy, for sure. And probably my best friend if I really stop and think about it. But…oh he told you, didn’t he? Lydia: His whole song and dance about how God told him I was going to marry him. I can see it on your face. Grr. I’ve told him and told him to put that out of his head–and at least he isn’t pestering me about it anymore–but that guy could teach Olympic athletes a thing or two about carrying a torch. Me: You’re not even a tiny bit curious what it’d be like to date him? Lydia: Maybe a little, I guess. But I have Brad. And sure, since you’ve been talking to Kevin, you probably know all the dirty little details about Brad. But that cheating was a one-time thing. We’ve moved past it. He just…was making a point about something and now that we’re on the same page there, well, we’re solid. Really solid. Rock solid. Lydia: Whatever. We’re good. And hey, speaking of Brad, I need to run and get ready for our date tonight. We’re going dancing. Plus…I think I just heard someone at the door. Gotta run. Me: …Oookay. Well, thanks for chatting with me! Yeah…she’s gone. As you can see, Lydia’s a little snippy and just a tad focused on some of the wrong things right now. But I have hope that she’ll turn it around. I worry a little about what that’ll take but…I’m guessing since she lives in a romance novel things’ll work out all right in the end. 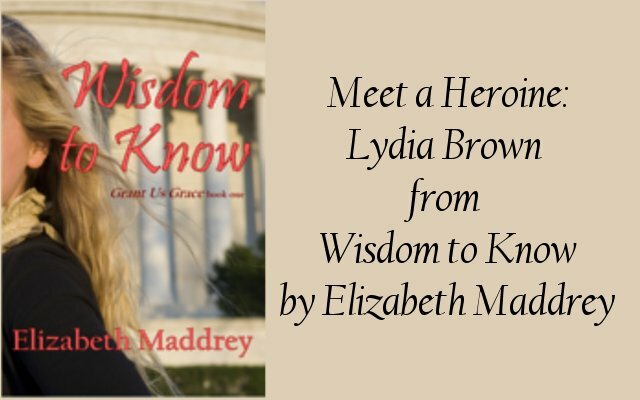 If you’d like to read Wisdom to Know, I’d love to give away an ebook or two – just leave a comment and I’ll choose a winner next week! Poor girl – sounds like she is tryin a bit hard to convince herself that everything is okay…. Would love to see how it turns out!